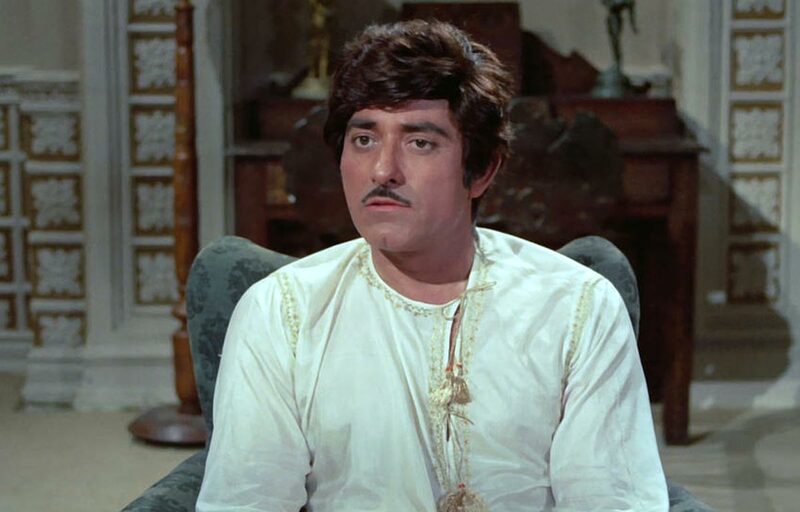 No One Knew The Real Raaj Kumar? I was in the tenth standard when I first heard stories about his being a man who had killed a police officer and was acquitted. I had heard stories about how he wore gold wrist watches, gold chains and gold bracelets and how he made mincemeat of people in high places without thinking of the consequences. I also came to know that he used to wear the most expensive wigs of which he had many and I had heard about how he insulted even the best of writers, tore the pages on which they wrote dialogues for him and then wrote his own dialogues. Time passed. I had joined “Screen”and my office was at Express Towers at Nariman Point. There were times when left office at a little before six pm and on one evening I saw the great J.R.D Tata driving home from Tata House in South Bombay with him sitting near his chaffeur and from the other side I saw Raaj Kumar driving in his Plymouth dressed in the way a golfer dresses when playing golf. I later learnt that he used to go to the US Club in Colaba every evening when he was not shooting. I made it a habit to come down at six pm and very rarely did I miss the chance of seeing the two great men J.R.D Tata and “Jaani”crossing each other. What a sight it was for this boy who was born and brought up in a village where the only luxury I could have was dream! I continued to listen to stories about the man and his many mad ways and my desire to face him grew stronger. I had a friend in Kulbhushan (which was also the first name of Raaj Kumar) who had started as a publicist in films and had risens to be a producer of big films and one of his biggest films was “God And Gun”which had Raaj Kumar and Jackie Shroff in lead roles. I was as good as a part of Kulbhushan’s unit and this I felt was my best chance to meet the “mad”Raaj Kumar. The unit was shooting at night at the Chandivali Studio.Raaj Kumar was sitting on an ordinary Charlie far away from the crowd which was formed of members of the unit. That night I decided that I would not go back home unless I met Raaj Kumar. I kept walking towards him while the members of the unit pleaded with me not to take the risk, but I continued walking towards the man they all were so scared of. I reached the charpai and he looked at me as if I was a piece of dirt and said,“Kaun hain? Yahaan aane ki jurrat kaise ki tumne”? I sank into my chappals but I was determined to meet him and switched on to English and asked him,“Mr Raaj Kumar, why did it take me two hours to think of coming to you? Why are people so scared of you”? Even before I could say anything more, he said,“sit down here, next to me, I give you five minutes. We will talk and if you turn out to be a fool like most people in this industry are, I will get you physically lifted and thrown out”. I looked at my wrist watch and realised that we had spoken for more than an hour as the unit kept looking at us.“We are friends from this night if you want proof, stay awake at six thirty in the morning and I will call you”. I walked back life a soldier who had conquered over a giant and then walked back home for more than two hours because I couldn’t believe that I had met the man about whom I had heard such scary stories. The next morning, my black phone rang and I was more than shocked to hear his voice say,“Kaise hai aap mere naye dost? I hope the fisherwomen with their big bums are treating you well”. I was stunned to silence and he said,“Janni, kabhi aakar mila karo. There is something about you that has made me take a liking for you”. How could I react? I was bringing him from his Worli house to the Dimple Studios belonging to Rajendra Kumar, his colleague in “Mother India”. His car broke down near the Lucky Restuarant outside Bandra Station and he immediately called for an auto and got into it. The driver looked visibly scared and I was puzzled. How could the Raaj Kumar travel in an auto? But, he said he was enjoying his first trip in an auto. We reached Dimple Studios and he saw a framed photograph of Rajendra Kumar at the entrance and took off his footwear and called his man Ibrahim and asked him,“Jaani aapne mujhe bataya kyon nahi ki yeh gaye”? It was his typical way of pulling down a man who had the guts to put up his photograph on the wall to show how important he was. For Raaj Kumar,a photograph like that was only put up after a person had died and gone away. His son, Puru was involved in a major accident in which he had killed a man and he was arrested and put behind bars.Raaj Kumar arrived at the police station and asked the inspector incharge to get him an English dictionary and asked him to see the meaning of ‘accident’and said he would come back the next morning and wanted to see Puru not only released, but also see that no charges were levelled against him. The case was never heard of again. He always had his meetings and dealings over money at the Jewel Of India restaurant close to his house and accepted his fees only in cash and all the money only in the large five hundred rupee notes. He once saw Zeenat Aman at the trial of a show and told her,“Aap bahut khoobsurat hai, filmon mein kaam kyon nahi karti”? He had a great liking for cigars and pipes and had a large collection of them from different parts of the world. His wigs also came made in other countries and the only liquor he drank was Black Label Scotch and if he was invited to a party, he sent his brother in advance to see whether they were serving genuine Black Label Scotch and his decision to go or not depended on the report he got from his brother who used to work in a five star hotel. He was the hero of a film called “Ulfut”with Waheeda Rehman and Sadhana as his heroines and is said to have created havoc for them and the producer, K. Razdan who was a leading publicist who had worked with Guru Dutt and all the leading banners. The unit faced so many problems because of him that Razdan decided to write a book on his experiences with Raaj Kumar and called it “Nark Yatra”. He however did not get it published but was very happy when he filed a suit against Raaj Kumar and saw him sitting in the coat on a wooden bench which he had to share with prostitutes and pimps.Raaj Kumar later spent lakhs of rupees to remake and release the film as “Ulfet”(he was very particular that “Ulfat”be spelt with an ‘e’) ki nayi manzilein”. The film was a disaster. He could use any excuse to create problems for his producers. Like he didn’t like how a cinematographer called G. Singh who was a sardar scratched his beard and he refused to do Prakash Mehra’s “Zanjeer”because of a particular brand of oil he used in his hair. There were rumours about his falling a victim to cancer of the throat. He was shooting for Subhash Ghai’s “Saudagar”those days.A nervous Ghai one day asked him whether the rumour was true and he just said,“Jaani, Raaj Kumar marega toh zukaam se thodi na marega, koi badi bimari se hi marega na”. He was finally dying of cancer, but he refused to go to any hospital. He stayed at home and it was very unlike Raaj Kumar to know that he spent most of his time reciting the Hanuman chalisma. The last night of his life he was alone in his room and died reciting the Hanuman chalisma. He had asked his family but to inform anyone in the industry about his death and asked them to just wrap up his body in a white sheet and take his body to the Shivaji Park electric crematorium and before the industry could know the bitter truth and tried rushing to his house, he was already a heap of ashes.